This past fall, the English and Art Departments of the University of North Florida dedicated a new sculpture in the UNF Peace Plaza, the Henry David Thoreau Table for Civil Disobedience. In the website description of the Thoreau Table, Dr. Jason Mauro writes, “Thoreau warns us that every institution, including our own University, is in danger of passively and invisibly doing violence to even its most sacred principles, and this monument and the essay it celebrates stand as a reminder that the strongest institutions are the ones that continually question their own virtue.” As a monument to civil disobedience, the Thoreau Table is a physical reminder of our necessity to constantly question ourselves and the world around us. 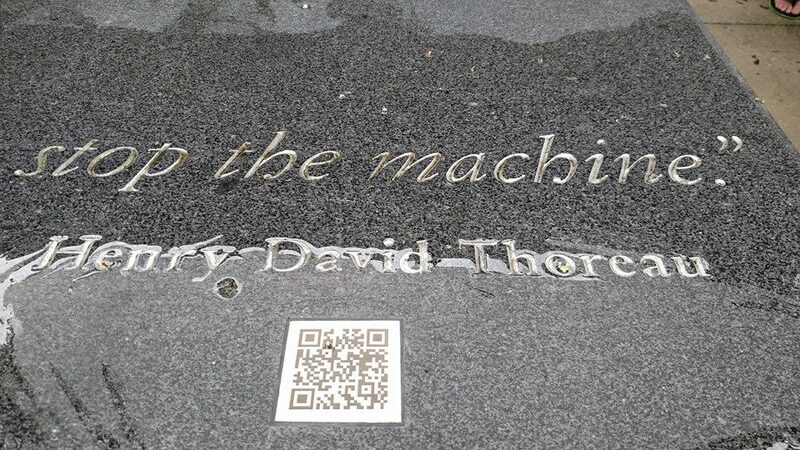 In this spirit, the students of ENC 4930 Network Culture constructed what media scholar Gregory Ulmer calls a MEmorial, or an electronic monument around the Thoreau Table and its dedication ceremony. Utilizing the Augmented Reality program Aurasma, these students embedded photographs of many demonstrations of peaceful social protest into the trigger images around the UNF Peace Plaza. The continuation of this augmented reality critique is based on Mark Swarek’s “Occupy Wall Street AR,” which invites anyone to send in their social protest picture to be placed electronically at the New York Stock Exchange. In our case, anyone would be invited to share their protest picture, whether it be student, faculty, staff, or administration to be electronically placed at Thoreau’s Table. 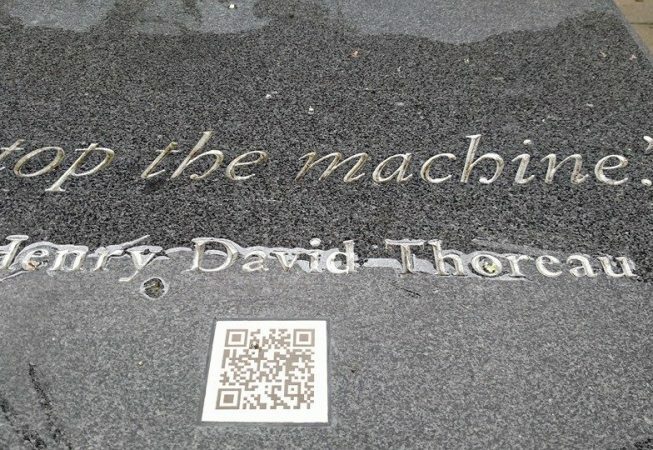 A link to the current, but moveable, Facebook site is located here: https://www.facebook.com/Henry–DAvid–ThoReau–An–Augmented–Reality–Intervention–159105321097006/ This site includes pictures from the dedication, as well as the trigger images for many of the social protest overlays. With the support of Digital Humanities, this site would be moved and reworked to accommodate the continued use of AR critiques at Thoreau’s Table.